Wouldn’t it be great to only focus on your core business and to serve your customers even better? Typically, organizations operate reactively and waste a lot of time due to lack of information. Change towards proactivity is the key to stressless operations. Europress SMART is a system of digital services providing tools for effective fleet management. The system consists of advanced components and processes that integrate the SMART devices into an intelligent network. By connecting, collecting and analyzing data you get insights on your assets. Learning from these insights contributes to business intelligent decisions. Europress SMART Fleet Management system is available in three distinctive subscription tiers: SMART Intro, SMART Insights and SMART Integrated. Stay up-to-date and keep track of your assets – SMART Intro gives you real-time access to your fleet. You can easily locate your machine and view its present state. Maximise up-time, utilisation rate and act proactively to increase customer engagement. to adopt to changes in advance. Unlimited possibilities with integrated ecosystem. Plug into a cloud-based service to link the asset data with your current tools in place and customize to fit your operations. 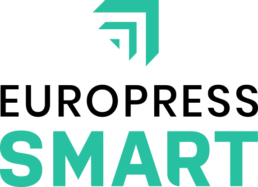 SMART platform provides various integration endpoints to your internal systems. Custom integrations can be developed as needed.